Sculptor: Jerome Connor, Washington, D.C.
During a meeting, in 1904, of the Emmet Club and the United Irish Societies in the District of Columbia on the 126th anniversary of the birth of Robert Emmet, the group resolved to “appeal to the American patriotism” to erect statues to Irish-Americans who had served the United States. In 1913 the Arts and Industry Building, first know as the United States National Museum of the Smithsonian Institution agreed to accept a statue of Robert Emmet to be placed in its rotunda. In 1917 the statue was finished and the unveiling was scheduled for June 28 at the Museum of Natural History. President Woodrow Wilson, cabinet members, diplomats, and members of Congress were at the unveiling of the Emmet statue. 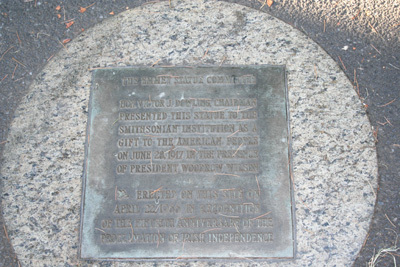 A committee of American citizens of Irish birth presented the American government with the statue. 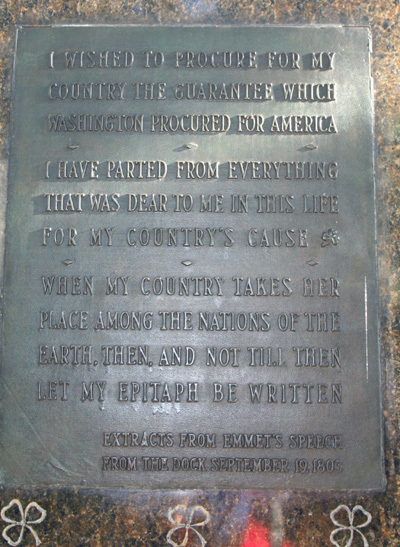 The statue, sculpted by Jerome Connor, an Irishman living in Washington, D.C., was cast at the Washington navy yard, the first statue to be cast in the District of Columbia. After its unveiling the bronze statue, standing 7-feet tall, was placed in the rotunda of the Museum of Natural History until 1964 when it was taken down and placed in storage. 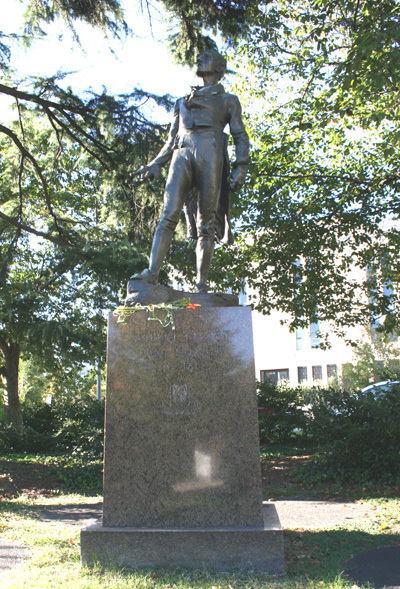 In 1966 the statue of Robert Emmet was taken out of storage and placed at the triangle park at Massachusetts Avenue and 24th Street, NW as part of the National Park Service’s Capital Beautification program. The dedication coincided with celebrations of the 50th anniversary of Irish independence. 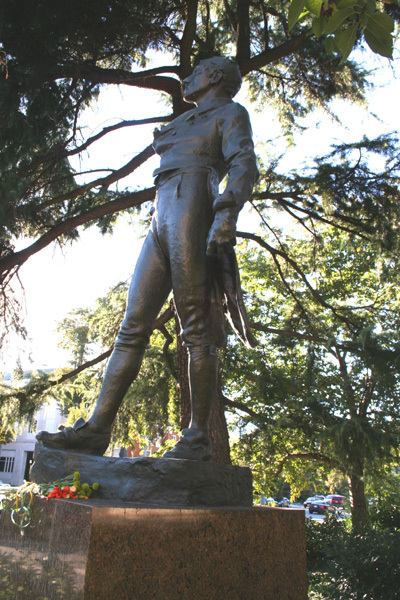 About Robert Emmet: Robert Emmet is revered by many Irish and hailed as one of the great revolutionaries for Irish independence. 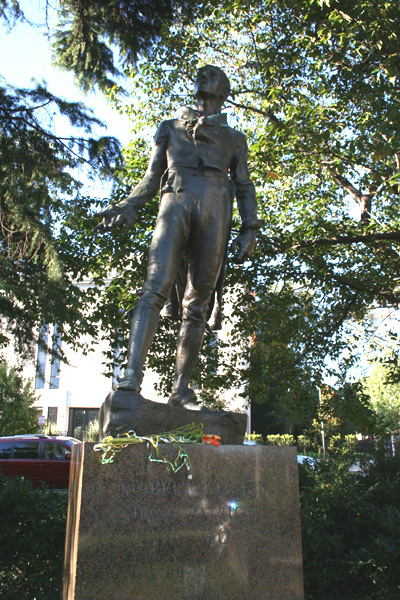 At the age of 25 he led rebellion against British rule in 1803 and was captured, tried and executed.